DB2 Universal Database (DB2 UDB) has long been known for its technology leadership. 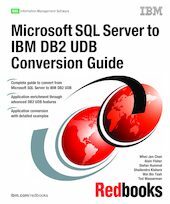 This IBM Redbooks publication is an informative guide that describes how to convert the database system and applications from Microsoft SQL Server to DB2 UDB Version 8.2. This guide presents the best practices in conversion strategy and planning, an architecture overview of the two relational database systems, migration tools, and practical conversion examples. It is intended for technical staff involved in a SQL Server to DB2 UDB conversion project. We discuss, in detail, the conversion of database structure, data, and database objects including stored procedures, triggers, and user defined functions. We address SQL and application conversion considerations. Examples are used throughout the book to illustrate the conversion and to provide solutions and work-arounds for different scenarios. In addition, we provide a DB2 tools and wizard usage overview, performance considerations, and testing and troubleshooting techniques. Finally, a migration scenario using the IBM DB2 Migration Toolkit is included to show the complete migration process.